Today I'm excited to share a very special recipe that came about as Andrea Mazandi of west elm and I were corresponding and planning the upcoming Etsy Pop-Up Shop at west elm event this coming Saturday here in Vancouver. Andrea having heard of our famous nanaimo bars here in Canada was keen on including something similar for the event and I being a fan of cupcakes joked "a nanaimo bar cupcake"! Andrea contacted Butter Baked Goods and well, the rest is history! So today, Rosie of Butter Baked Goods was kind enough to share the recipe with us - which I can hardly wait to taste (they sound amazing)! Fun fact: Butter Baked Goods, a very popular bakery here in Vancouver has a new cookbook coming out soon which should be not only super-delicious, but beautiful as well, as it's photographed by local interior and food photographer, Janis Nicolay (a contributor here at Poppytalk and one of our Etsy Pop-Up Shop vendors)! So now to the recipe! Spread the walnuts on a baking sheet and place in the oven for approximately 15 minutes or until they are nicely toasted. Allow the nuts to cool before chopping and then set aside. On a large piece of parchment paper, sift the flour, cocoa, baking soda and salt. Set aside. In a mixer, fitted with a paddle attachment, cream the butter and both sugars until light and fluffy. Scrape down the sides of the bowl. Combine the milk, sour cream, coffee and vanilla in a liquid measuring cup and whisk to blend. With the mixer on low, add the dry ingredients in 3 parts, alternating with the liquid in 2 parts. Making sure to begin and end with the dry ingredients. Again, you will want to scrape down the sides of the bowl several times during this process to make sure everything is fully combined. Gently fold in the coconut and toasted walnuts. Using a large ice cream scoop or two spoons, fill the cupcake liners about ¾ of the way full. Place in the oven and bake for 20 to 25 minutes or until a wooden skewer inserted into the middle of the pan comes out clean. Allow the cupcakes to cool for 10 minutes before removing them and allowing them to cool completely on a wire rack. While they are cooling you can prepare your Custard Butter Cream….. In a mixer, fitted with a paddle attached, cream the butter until light and fluffy. Scrape down the sides of the bowl. Turn the mixer to low and slowly add the icing sugar and custard powder. Continue mixing until the icing sugar and butter are fully combined and then with the mixer still running slowly add the milk and vanilla. Turn the mixer to high and continue beating until the butter cream is light and fluffy. In a double boiler or a small saucepan set over simmering water, melt the chocolate and butter until smooth. Pour the melted chocolate on to a piece of parchment paper and use the back of a spoon to spread it evenly in a thing layer. Allow the chocolate to set up until it is firm enough but still pliable enough to cut with a circular cookie cutter. Transfer the cut discs to a new piece of parchment on a baking sheet and place in the refrigerator to fully set. Fill a large piping bag fitted with a plain tip with the butter cream and pipe the top of each cupcake. Place a chocolate disc on top of the butter cream. If you don’t have a piping bag you can always use a small offset spatula to ice the cupcakes. Thank you Rosie and west elm! The Etsy Pop-Up Shop is this Saturday, May 25 from 1pm – 6pm at west elm and west elm market (right next door), in Vancouver. Each of the featured Etsy sellers will be set up within the west elm store to share and sell their homegoods, jewelry, stationery and more. Special cupcakes and treats from Butter Baked Goods will be there too! Please RSVP at facebook.com/westelm/events . Oh the layers! It's combining everything delicious in life into one cupcake. Love the green glass cake ped. So darling. Thanks ladies! Can't wait to try them out! What!? This is unreal. I come from Vancouver Island and I will have to try this. 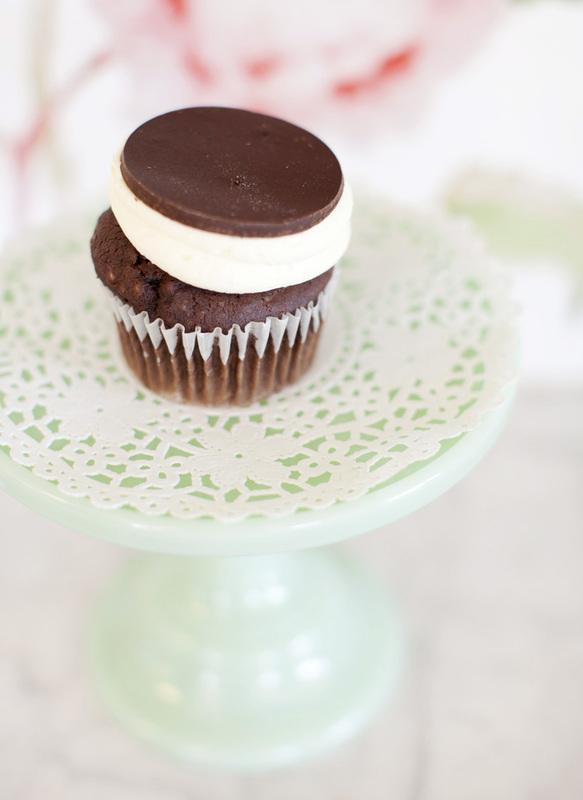 Cannot think of a better marriage than Nanaimo bar and cupcake.